Part 3 of a 4-part series in which a scientific researcher learns how science advocacy groups influence the legislative process. Read Parts 1 and 2 about her Hill Day experience and her interview with a science advocacy group. 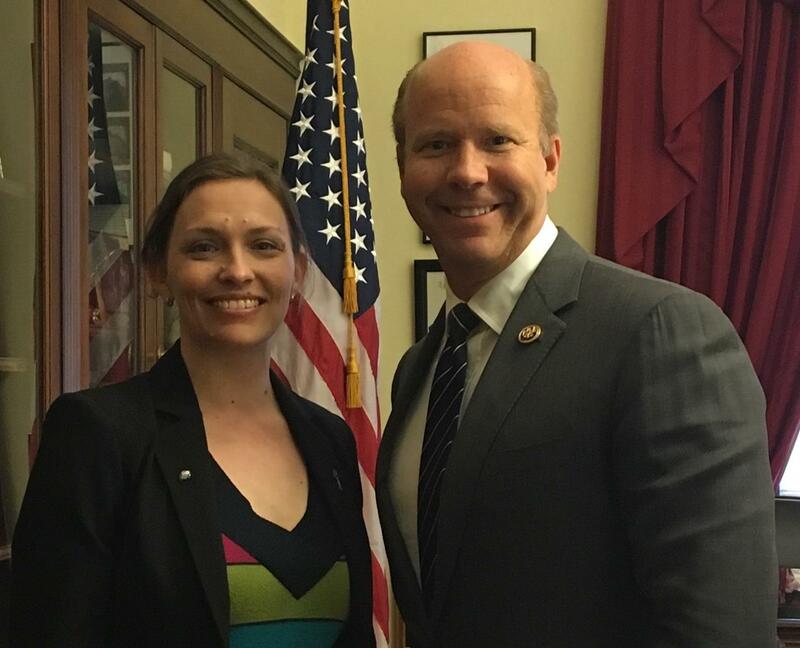 On April 27, 2016, as part of my Society for Neuroscience (SfN) Early Career Policy Ambassador outreach activities, I met with Representative John Delaney (D-MD, 6), in his office at the Longworth House Office Building in Washington, DC. This was my first in-person meeting with an actual legislator, as during Hill Day the lawmakers were, unfortunately, too busy to meet with us in person. It was exciting getting ready for a face-to-face meeting with my Congressman! Rep. Delaney represents the 6th Congressional District in Maryland, which encompasses the cities of Gaithersburg, Germantown, Hagerstown, Cumberland, and my home city, Frederick. It also neighbors the 8th District, which encompasses Bethesda, home to the National Institutes of Health (NIH). The first take-away from this meeting was, when Congressional staffers tell you that you have a 15-minute slot with your Representative, they mean it! I drove nearly an hour each way from Frederick to meet with Rep. Delaney, and I sat with him and two of his staffers in his office for exactly 15 minutes. And yet, the 15 minutes felt like a long time given what I knew about the tight schedules of lawmakers. Indeed, Rep. Delaney and I had plenty of time to discuss the legislative process surrounding pro-science policy. Question 1: Since your election in 2012, what are some of pieces of pro-science legislation you have been actively involved in? Notably, Delaney has repeatedly voted to increase funding for the NIH and the National Science Foundation (NSF). Regarding specific legislation, Delaney recently authored a clean energy amendment to H.R.702, a House bill to lift the ban on oil exports. This amendment emphasized the need for Congress to invest in clean energy technology and energy efficiency, and was passed in October 2015. Working with his colleague Senator Ben Cardin (D-MD), Delaney also introduced “50×30” resolutions in the House and Senate to encourage a national goal of generating “more than 50 percent of our electricity from clean and carbon-free sources by 2030.” In addition to his focus on increasing alternative energy research to reduce the effects of climate change, Delaney also noted that, “funding is lacking at the basic research level,” and that such funding is critical to discovering treatments for debilitating diseases like Alzheimer’s and schizophrenia. Question 2: How does your office identify science topics to become involved in? Congressional offices pay attention to topics that are relevant to the representatives’ home districts. In Delaney’s case, he is particularly aware of issues affecting the large number of constituents who work at Fort Detrick (home to the Frederick National Laboratory for Cancer Research, sponsored by the National Cancer Institute), NIST, NIH, and NSF. His office also prefers to focus around particular diseases or epidemics rather than general science funding. Question 3: How does your office work with outside groups to stay informed on science topics? Delaney’s office has points of contact at universities like Johns Hopkins University and the University of Maryland, and will defer to the presidents of these institutions, or their affiliated hospitals, to help keep his office up to date with the latest scientific findings. Question 4: What particular steps of the legislative process are you directly involved in? Given the convoluted nature of lawmaking in the U.S., Delaney acknowledged that there are countless ways he and other lawmakers are directly involved. Specifically, however, he said he strives to “find a vein of bipartisan support” for his preferred pieces of legislation, and that building bipartisanship constitutes a large part of his action in the legislative process. Question 5: Which steps do you think scientists can effectively engage in during the legislative process to inform lawmakers? Delaney encouraged individuals to talk directly to their representatives (with in-person meetings and phone calls, especially – advice I’ve gotten along the way during this journey), to make their arguments in economic terms, and to have a “laserlike focus” when meeting with their representatives about a particular topic. In all, though the meeting was brief, I found it to be a valuable opportunity to hear directly from my representative and to learn ways to engage most effectively with lawmakers. I was also pleasantly surprised at how accommodating Rep. Delaney’s office was regarding my request to meet: I was able to meet in person with him no more than two weeks after submitting my initial request. Most importantly, Rep. Delaney himself seemed pleased to meet face-to-face with a scientist who clearly took interest in the legislative process. The take-home: don’t be afraid to call, email, or meet in person with your Representative! Your voice will be heard, and face-to-face meetings are not as intimidating as they may seem. If you don’t live in or near DC, you can schedule meetings with your representative when s/he is visiting their home district. Posted on May 18, 2016 May 18, 2016 by EditorPosted in News, Outreach NewsTagged John Delaney, SfN, Society for Neuroscience, Washington. Next Next post: When are rats, mice, birds and fish protected by US federal laws?